Product #752 | SKU 1490-008-190 | 0.0 (no ratings yet) Thanks for your rating! 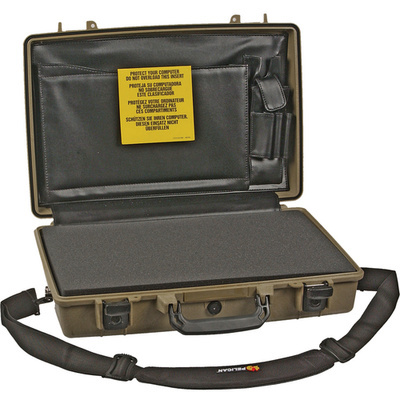 Watertight, Dust-Proof, Corrosion-Proof, Slim Attache Design Case. The 1490CC2 Computer Case with Lid Organiser and Foam is a watertight, dustproof and corrosion proof case with a slim attache design. It is designed to carry a laptop computer with a screen up to 17" and accessories. The case has a built-in purge valve for changes in altitude or temperature and locking latches with keys. It is carried by a padded folding handle and a removable, shoulder strap. This case has a 2-piece foam set and computer lid organiser included. Compatible with laptop computer with a screen up to 17"
Laptop computer with a screen up to 17"